The word beignet (pronounced ben-YAY) comes from the early Celtic word bigne meaning “to raise.” It is also French for “fritter.” Beignets, a New Orleans specialty, are fried, raised pieces of yeast dough, usually about 2 inches in diameter or 2 inches square. After being fried, they are sprinkled with sugar or coated with various icings. There is more circumstantial evidence supporting an Andalusian introduction of beignets into Mediterranean France. The Spanish name for yeasted fritters is “buelos,” and while I have not traced the etymology of the Spanish term, I would be surprised if it did not share a common root with the Provenl bugne. Moreover, pets de nonne, deep-fried balls of airy choux paste, were known as “Spanish beignets” in the late Middle Ages, again associating deep-fried dough with Spain. Keeping in mind that Andalusia was under Islamic rule from the eighth until the end of the fifteenth century, many Islamic foods had ample opportunity to be integrated into what has evolved into Spanish cuisine. 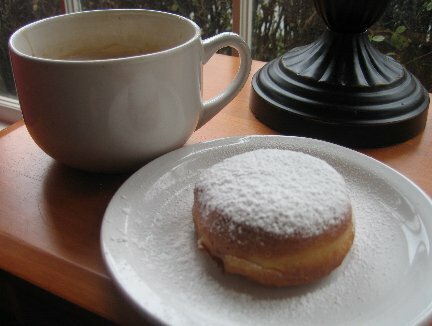 Another reason to believe that beignets may have migrated from the Islamic to the Christian worlds is that the deep-frying used to prepare beignets is a relatively expensive technique, requiring a profligate use of fat and preferring metal pans to clay to withstand the high temperatures that the hot fat reaches. Deep-frying thus would have been more typically practiced at the elite end of the spectrum, so that recipes for fritters likely were distributed at the courtly level, only later to be diffused downwards. The French colonists of the 18th century brought the recipe and custom of making beignets to New Orleans. Some historians believe that the Ursuline Nuns of France, who came to Louisiana in 1727, brought this simple pastry to New Orleans, but this is not based on any facts. The ancient French colonist brought the custom of serving sweet entrements and eatres, such as Beignets, Compotes, Souffles, Gelees, etc., from the old mother country to Louisiana. The Creoles applied these to the various delightful and refreshing fruits, which abound in Louisiana . . . 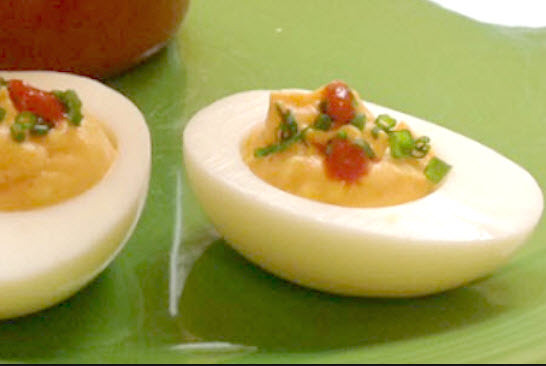 The custom of serving these sweet entrements spread from New Orleans to other portions of the United States, till now no fastidious chef would think of keeping a fashionable hotel or restaurant with including some of these in the daily bill of fare. 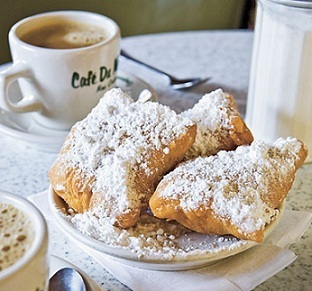 Beignets were most often enjoyed with cafau lait. In New Orleans, cafau lait is strong dark roast coffee and chicory, served with equal part hot milk. In the early history of Louisiana, chicory was added to coffee to stretch dwindling supplies. It was found that, in addition to stretching supplies, the chicory also created a smoother, richer brew. The addition of hot milk to strong coffee and chicory created one of the oldest and greatest coffee traditions in the world. The original Cafe du Monde coffee stand was established in the New Orleans French Market in 1862 and still operates today. The cafe is considered a New Orleans landmark that’s open 24 hours a day, 7 days a week. In fact, it is traditional to there for dark coasted coffee with chicory and beignets when visiting the city. At Cafdu Monde, there is only one food item you can order – beignets. The store is called a coffee stand, but it’s very large, with dozens of tables outside under the trademark green-and-white striped canopy, and more inside. On every table are plates of rapidly disappearing beignets. Cafdu Monde serves beignets in orders of three, and since that’s the only food item on the menu, you do not have to say what it is you are ordering. You simply say, “I’ll have an order and a cafau lait.” Expect a wait in line if you arrive during peak hours (even longer if you want a table). In 1986, beignets became the Louisiana State Doughnut. * Use just enough vegetable oil to completely cover beignets while frying - approximately 2 inches deep in the pan. Slide the dough pieces slowly into the hot oil(this is to avoid splattering) and fry the beignets (2 or 3 at a time) approximately 2 to 3 minutes or until they are puffed and golden brown on both sides; turning them in the oil with tongs once or twice to get them evenly brown. The beignets will rise to the surface of the oil as soon as they begin to puff. NOTE: If the beignets don't rise to the top immediately when dropped into the oil, the oil is not hot enough. Remove from oil and drain on paper towels. Serve while still warm. Grab yourself a steaming cup of Cafe au Lait or your favorite hot coffee and enjoy! Very interesting recipes. I wish you would send me recipes. What recipes are your wanting? Which yeast that I have to use? The one that I have to mix with water or the one that I just add to the dry ingredients. In this recipe, I use Instant Dry Yeast. Using this yeast, you just add to the dry ingredients per the recipe. You make reference to the Spanish equivalent for beignets S “buelos.” The actual Spanish word should be buñuelos.